Since the beginning of Christianity, the faithful used to assemble together for their prayers twice a day, in the morning and in the evening. The ancient Christian writer, Tertullian (d. after 220 A.D.), at the turn of the second century, called these common prayers “legal prayers,” i.e. prescribed by the Church authority (cf. Tertullian, On Prayer, 25). And the fourth century document admonished the bishops: “When you instruct the people, command and exhort them to come regularly to church, in the morning and evening every day, and not to forsake it on any account” (cf. The Apostolic Constitutions II , 59). 1. After the ” Peace of Constantine” (313 A.D.), daily gatherings of Christians took place in their churches and gave rise to two separate services: Matins in the morning, and Vespers in the evening. 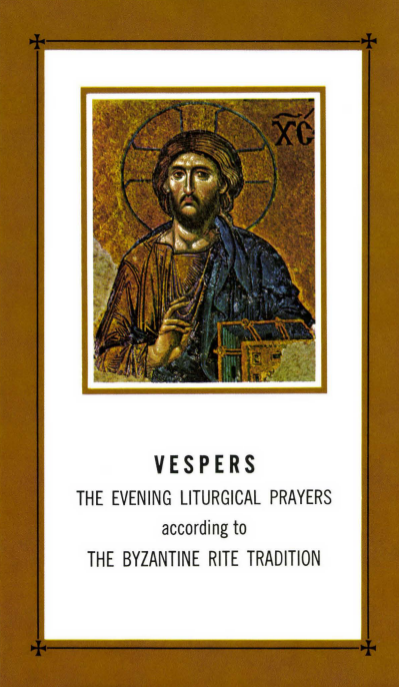 In this leaflet, we will limit ourselves to the service of Vespers which begins the liturgical day in accordance with the day of creation – as indicated by the Holy Scriptures: “There was evening and there was morning, the first day” (Gen. 1:5). The Latin word vesper, from which the evening liturgical services took their name, originally meant an evening star and only by transference – evening, when the evening stars (vespers) started to appear. In the Old Slavonic these liturgical prayers were called Vechernaya Sluzhba (an evening service), which by contraction became Vechernya, as in Greek, Espertinos (pertaining to the evening). It is then fully understandable why the early Christians associated light with the sacred presence of our Lord Jesus Christ in their midst, being assured by Him: “Where two or three come together in my name, there I shall be in their midst” (Mt. 8:20). Thus during their evening gatherings, as the candles or the lamps were being lit, the Christians symbolically (mystically) welcomed the Eternal Light, Jesus, into their midst with the joyous hymn, O Joyful Light (see back cover notes below), hailing from the second century. St. Basil the Great refers to this ancient hymn as the Hymn of Thanksgiving, explaining: “It seemed fitting to our Fathers not to receive the gift of light at eventide in silence, but as soon as it appeared they immediately gave thanks with a hymn. Who was the author of this Hymn of Thanksgiving at the lamp-lighting time we are unable to say. But it is very old and the people are st ill singing it.” (cf. On the Holy Spirit, 73) In the year 375 A.D., St. Basil referred to this hymn as “very old,” and yet it is still sung at Vespers even to this day. At the end of the fourth century the famous Spanish pilgrim to the Holy Land, Egeria, testified that in Jerusalem when all the lamps and the candles were lit (making “enormous light”), the bishop used to enter the Church of the Resurrection with a procession (hence the ceremony of entrance with the incense at Vespers to the present day), and the people welcomed him with a loud chant (cf. Diary of a Pilgrim, ch. 24). 3. Conscious of the living presence of Our Lord Jesus Christ in their midst, symbolized by light and represented by the bishop or priest, the people then turned their earnest prayer (in Greek, ekteny) and supplication (hymn, “O Lord, keep us this night”) to their Savior and Redeemer. Having received the blessing from the bishop or the celebrant priest (cf. Prayer for Bowing the Heads), the faithful were ready to depart in peace to their homes, since with their spiritual eyes they have seen “the salvation” which the Savior has “prepared in the sight of all the people,” a light to enlighten all the nations of the earth (cf. the Hymn of Simeon; see back cover notes below). This Hymn of Simeon (Lk. 2:29-32), which under the symbol of light emphasizes the universality of salvation, was introduced, according to the testimony of the Apostolic Constitutions (VII, 48), as a dismissal hymn as early as the fourth century. From its formative stage, the service of Vespers was filled with the most meaningful symbolism (light, incense, entrance) and the deep religious experience of God’s goodness, mercy, and salvation, as well as of His constant presence among His people, guiding them by the “way of peace” (Lk. 1 :79) to their promised land. Such is the atmosphere created by our liturgical evening prayers, known to us as Vespers. 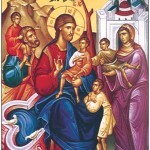 a) The Initial Part – sober meditation and reflection – is composed of the Initial Psalm 103 (104), priestly prayers recited silently, the Ekteny of Peace and the recitation of the Lamp-lighting Psalm 140 (141), of which the first two verses – “I have called to You, O Lord,” and “Let my prayer come before You” (see back cover notes) – are chanted, while the priest incenses the sanctuary and the people, symbolizing the people’s earnest prayer of repentance “rising to God like incense” (Ps. 140:2). b) The Central Part – thanksgiving and praise is centered on the entrance and the solemn singing of the hymn, O Joyful Light, mystically welcoming Jesus Christ in the midst of the faithful. The pristine recital of the Evening Psalms (Ps. 141, 129 & 116) that preceded the solemn entrance, was reduced to the last verses which serve as the introductory verses to the number of sticheras used (10 on Sundays, 8 on Holydays, and 6 on Weekdays). The stichera, as a liturgical hymn, is a chanted prayer vested in poetical form. The sticheras, as mentioned, are followed by a solemn entrance and the chanting of the hymn “O Joyful Light,” during which the priest again incenses. This time the incense symbolizes the divine presence (Is. 6:3 “and the temple was filled with smoke”). Then the Prokimenon introduces the reading from the Old Testament (prophecies fulfilled in Jesus Christ), which at the present time is limited only to festive days. c) The Concluding Part is dominated by the evening prayers of supplication. It begins with the Ekteny of Supplication (“Let us all say”), followed by an ancient hymn-recital, “O Lord keep us this night” (from the fourth century) , after which the Ekteny of Petition follows. Here, on the vigil of solemn Holy Days, the service of Litia is inserted (for the explanation of Litia, cf. Byzantine Leaflet Series, No.10, 1978). After the Ekteny of Petition, the Sticheras with the Versicles, in which the mystery of the feast or of the day is commemorated, are chanted. On Saturday evening it is the mystery of the resurrection. On the feastdays of Our Lord the mysteries of our salvation are recalled. On the feastdays of the Blessed Virgin Mary or of the Saints, their role and assistance in our salvation is emphasized. Strengthened with the assurance of our salvation, now we can with all confidence chant the Canticle of Simeon, Now You shall dismiss Your servant, O Lord (see back cover notes below). Our evening services are concluded with a proper Troparion through which the principal mystery of the day is briefly presented to us in poetical form. Dismissed with the blessing of the celebrant, we depart to our homes in peace. O Lord, I have cried to You, hear me: Receive the voice of my prayer when I call upon You. Let my prayer rise like incense before you; The lifting up of my hands like an evening sacrifice. O Joyful Light! Light and Holy Glory of the Father Immortal, the heavenly, holy, the Blessed One, O Jesus Christ! Now that we have reached the setting of the sun, and see the evening light, we sing to God, Father, Son, and Holy Spirit. It is fitting at all times to raise a song of praise in measured melody to you, O Son of God, the Giver of Life. Behold, the universe sings your glory. Now You shall dismiss Your servant, O Lord, according to Your word, in peace; because my eyes have seen Your salvation which You prepared before the face of all peoples, a light to the revelation of the Gentiles, and the glory of Your people, Israel.